help enhance security of their network by additional means. to exploit security breaches of popular TCP/IP architecture. stack is still evolving to defend against security attacks. addresses and port numbers specified by the applications. 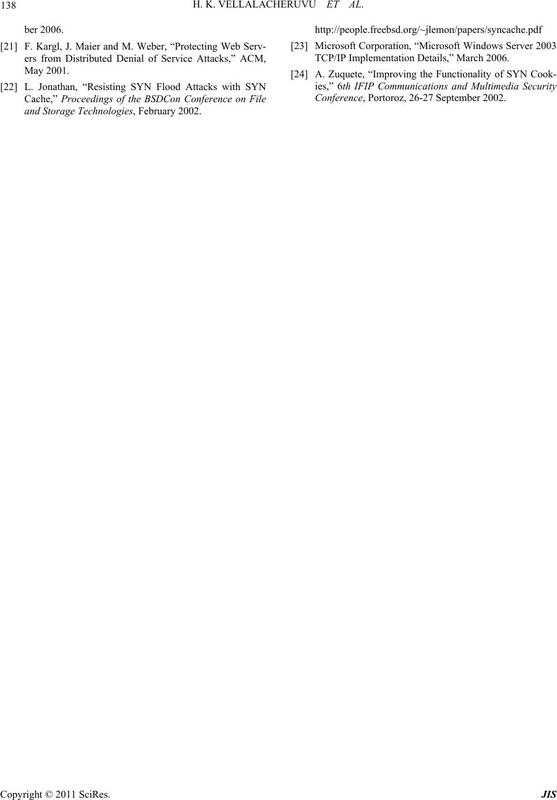 SYN request with its sequence number to the server. 132 H. K. VELLALACHERUVU ET AL. Figure 1. TCP three-way handshake. after the three-way handshake is co mplete. 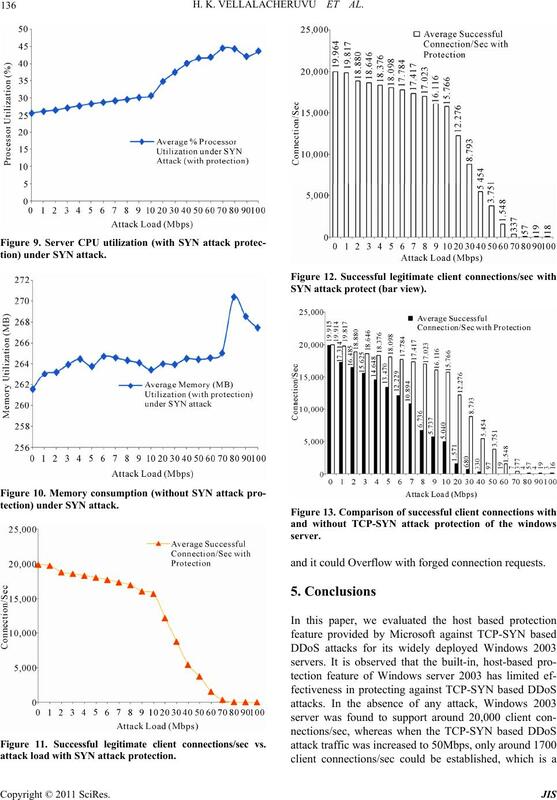 connection requests or TCP SYN packets (Figure 2). named after specific bit in TCP header specifications. early as 1994 by Bill Cheswick and Steven Bellovin . Figure 2. 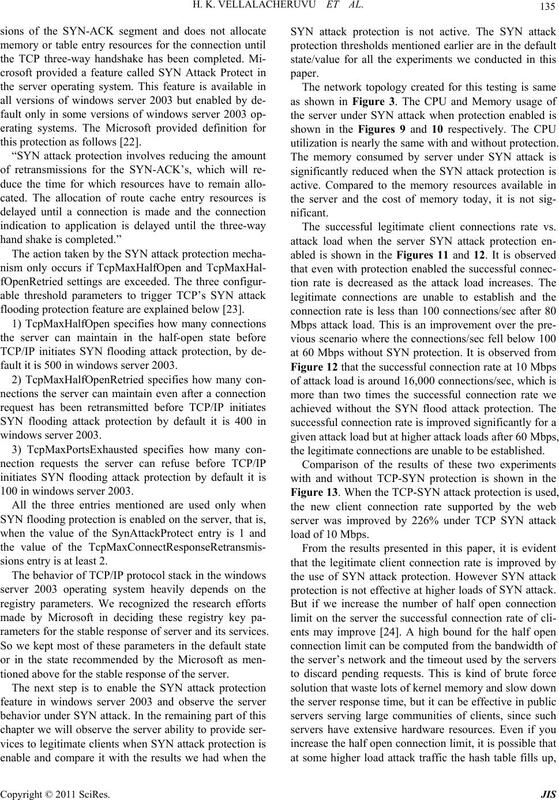 TCP SYN flood attack. plemented in m any popular com put er ope rating systems. layer becomes unresponsive to the legitimat e clients. and maintained during the lifetime of a given connection. H. K. VELLALACHERUVU ET AL.  Use all available memory. with a TCP connection reset. tempts are responded with a TCP connection reset. terminating the connection by exchanging FIN packets. sort of filtering done on the server side. and the statistical readings are collected for each second. i.e. 600 reading for each attack load. is under attack, and no protection is enabled at the server. 134 H. K. VELLALACHERUVU ET AL. 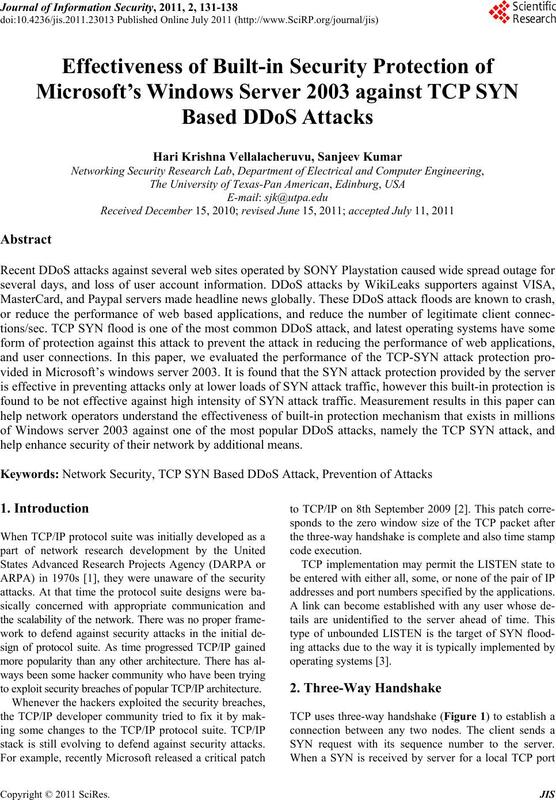 (without SYN attack protection) unde r SYN Attac k.
attack load without SYN attack protection. load intensity is 10 Mbps. this protection as follows . flooding protection feature are explained below . fault it is 500 in windows server 2003. 100 in windows server 2003.
sions entry is at least 2.
rameters for the stable re sponse of server and its ser vices. tioned above for the stab le response of the server. utilization is nearly the same with and without pro tection. The successful legitimate client connections rate vs.
the legitimate connections are unable to be established. protection is not effective at higher loads of SYN attack. 136 H. K. VELLALACHERUVU ET AL. Figure 11. Successful legitimate client connections/sec vs.
attack load with SYN attack protection. SYN attack protect (bar view). and it could Overflow with forged connection requests. devices to effectively defend against DDoS attacks. National Science Foundation , G rant No: 0521585. Mitigations,” RFC 4987, August 2007. Internet Transmission Control Program,” RFC 675, 1974. 31 January-4 February 2005, pp. 430-436.
and Applications, ICITA 2005, Vol. 2, 4-7 July 2005, pp. on Networks, ICON’06, Vol. 1, September 2006, pp. 1-6. Systems, Vol. 1, 20-22 July 2005, pp. 709-715.
ence on Networking, Cancun, 13-18 April 2008, pp. Systems, Vienna, 2-5 July 2002. Paris, 12-15 November 2002, pp. 302-311. 23-29 April 2006, pp. 38-38.
cations, Barcelona, 23-29 April 2006, pp. 1-5. 2004, London, 28 June-1 July 2004, pp. 208-212.
puter Applications, Vol. 31, No. 4, 2008, pp. 509-534.
and Storage Technologies, February 2002. TCP/IP Implementation Details,” March 2006. Conference, Portoroz, 26-27 September 2002.